These four ingredient Oatmeal Chocolate Chip Muffins are so incredibly easy, they take just five minutes to prepare. Original content posted November 2014. Updated January 2019. I will always have a special place in my heart for a good muffin. A recipe that creates a dozen single serving breakfast carbs at the ready? Oh, yeah. I’m down. The perfect addition to any breakfast or brunch and guaranteed to be a welcomed site by nearly everyone. And those that don’t welcome them? No worries, that means more for me! These Oatmeal Chocolate Chip Muffins have been one of my most favorite muffins for years now and I don’t see them losing their superstar status anytime soon. I was first introduced to these homemade Oatmeal Chocolate Chip Muffins when my husband and I stated dating during my junior year of college. Whenever his parents visited, his mom left all kinds of baked goods at his apartment. And these muffins were always the first to go. The same thing happens now, nearly 15 years later. Only now I’m making two dozen muffins at a time and fighting over the last one with my husband and three small children. 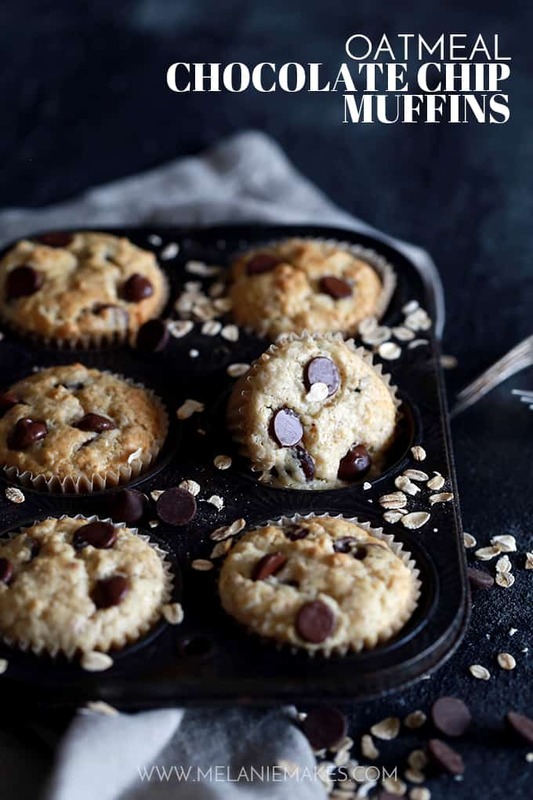 These four ingredient Oatmeal Chocolate Chip Muffins are so incredibly easy that they take just five minutes to prepare. My Homemade Oatmeal Muffin Mix, milk, egg and chocolate chips are stirred together and then magically transform into baked good deliciousness. I love when they emerge from the oven studded with melty chocolate chips. The original recipe from my mother-in-law included only a half cup of chocolate chips, but I doubled it in my recipe to a full cup. Believe me, I’ve yet to hear anyone complain. 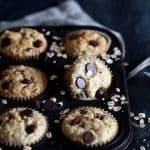 The same shortcut Homemade Oatmeal Muffin Mix used for these Oatmeal Chocolate Chip Muffins is also used for my autumn favorite Pumpkin Butterscotch Oatmeal Muffins as well as my fruit bejeweled Cherry Almond Oatmeal Muffins. You could make an entire muffin bar of sorts for breakfast using this mix alone. Now that would be my kind of breakfast! In a medium sized bowl, add Homemade Oatmeal Muffin Mix, milk, egg and chocolate chips. With a spoon or spatula, stir together until just combined and no dry ingredients remain. TIP: The parchment muffin baking cups from Paper Chef are my favorite as I’ve never had a muffin or cupcake stick using them! 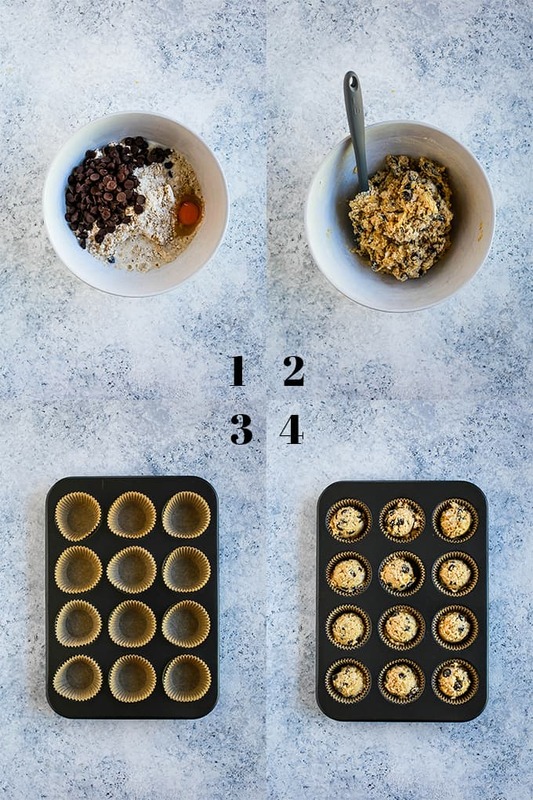 Using a large cookie scoop, fill each muffin cup with batter. Bake for 20-22 minutes or until toothpick inserted in muffin center removes cleanly. 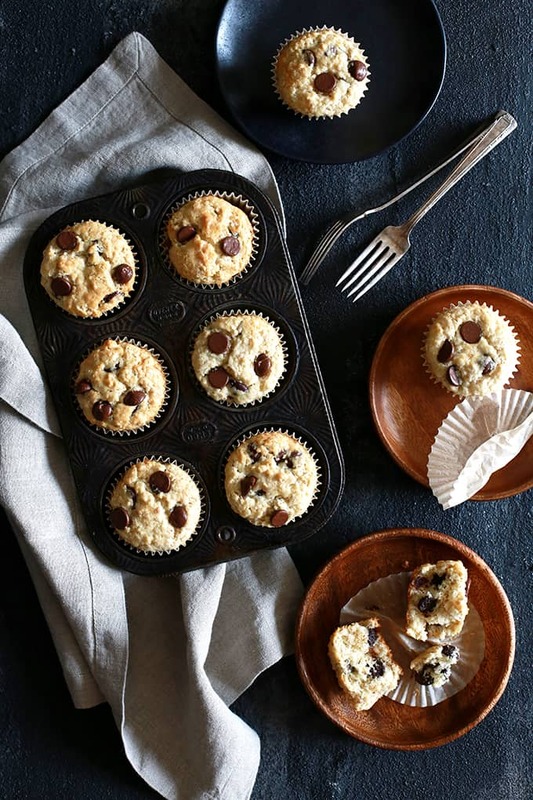 TIP: Using a cookie scoop insures muffins that are all of a uniform size. 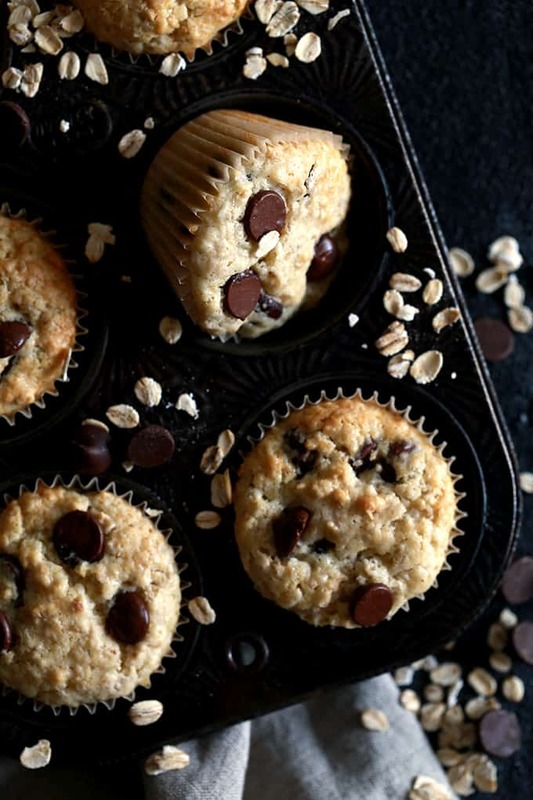 If you’ve tried these Oatmeal Chocolate Chip Muffins or any other recipe on Melanie Makes, please let me know your thoughts in the comments below. I love hearing from you and respond to each and every comment! 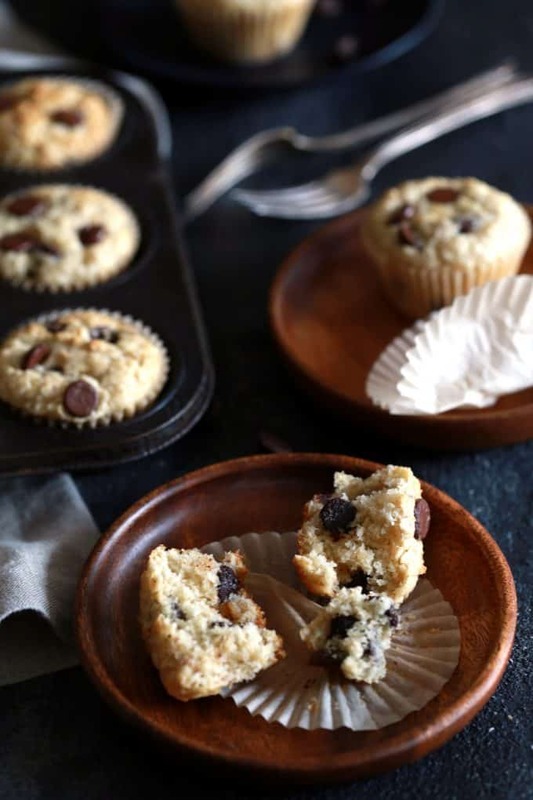 These four ingredient Oatmeal Chocolate Chip Muffins are so incredibly easy that they take just five minutes to prepare. Line muffin tin with paper liners and using large cookie scoop, fill each muffin cup with batter. Bake for 20-22 minutes or until toothpick inserted in muffin center removes cleanly. TIP: The parchment muffin baking cups from Paper Chef are my favorite as I've never had a muffin or cupcake stick using them! Looking for more delicious oatmeal and chocolate flavored treats? How about giving these decadent Chocolate Chip Oatmeal Caramelitas a try? Or maybe these Skinny Oatmeal Chocolate Chip Cookies? I also love the look of this creamy Chocolate Malt Oatmeal Smoothie. Yum! 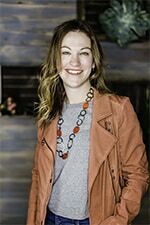 Thanks, Tricia! I'm sure they would disappear quickly at your house just like they do at mine! A perfect weekend breakfast treat! Absolutely! In fact, I think they'll be tomorrow's breakfast! These muffins are so pretty and look absolutely scrumptious! They definitely go fast in my house with three little ones that are big fans, Anna! Choco chip muffs are the best! Pinning! I agree, Lee! Thanks so much for Pinning! 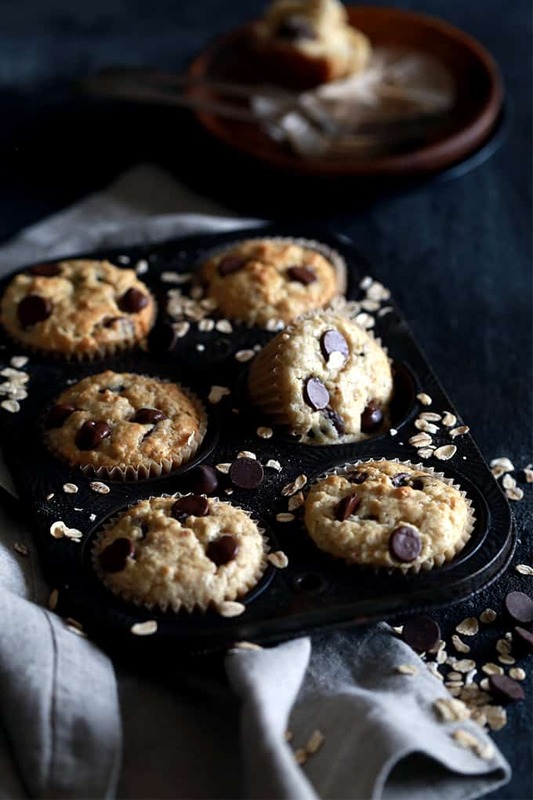 These muffins look amazing - I love the oatmeal chocolate chip combo! Such a classic combination, Stacey! Its a bald cupcake! How can you not like muffins?! Especially with oatmeal and chocolate chips?! Yes! Meg, you're a smart cookie - I like the way you think! My menagerie absolutely loves these, Cyndi - I'm sure yours would, too! COME TO MAMA ... And when I say "mama" I am referring to my MOUTH! I won't say how many I could eat in one sitting, Gigi! Melanie, these are definitely a muffin that is welcome to make an appearance at my house! Pinned! Thanks so much, Kristi! I love how versatile this homemade mix is and how quick these muffins come together because of it!